Most of us use the Windows operating system. And also know that Windows has its own built-in firewall program which is a nice and secure Firewall But you can easily install other firewall programs on your PC. Different Firewalls You Will Get Free And Paid In Two Ways, But I'm not in favour of using the Paid Firewall Program, because you're getting complex complicated all-around programs free. And these free firewall programs are easy to run from Microsoft's Windows operating system's built-in firewall program, and there are more features and options than that. But one thing is that when you run a separate firewall program on a PC, it's time to disable the Windows Firewall program. Because simultaneously, two defence software can harm your PC well. I brought today the best 10 free firewall programs that you can use to protect your PC from various Internet hacks. The following list is best to worst format, the positions of this list are sorted out by examining various features including program features, accessibility, software updates, and so on. But remember that a free firewall can never be a good antivirus replacement. So, my previous antivirus was invited to see the topmost list posts. So let's see if the best 10 free firewall programs. Comodo Firewall is the first place on our list. Understand this is a member program of the Comodo Antivirus family. Comodo Firewall will offer you features such as Incredible Internet Browsing, Ed Blocker, Custom DNS Servers, Game Mode and Virtual Kiosk. You can easily add any program to a firewall on this Comodo Firewall and drop it at the same time. There is no problem with configuring different ports and different options with a bigger route wizard. However, you can also customize the advanced settings of the Comodo Firewall. Comodo Firewall, which has a rating scan option that can scan all the currently running processes of your PC, and lets you know in the results how much the task is toasted This rating scan will be of great help to you if your PC is already infected with some type of malware. 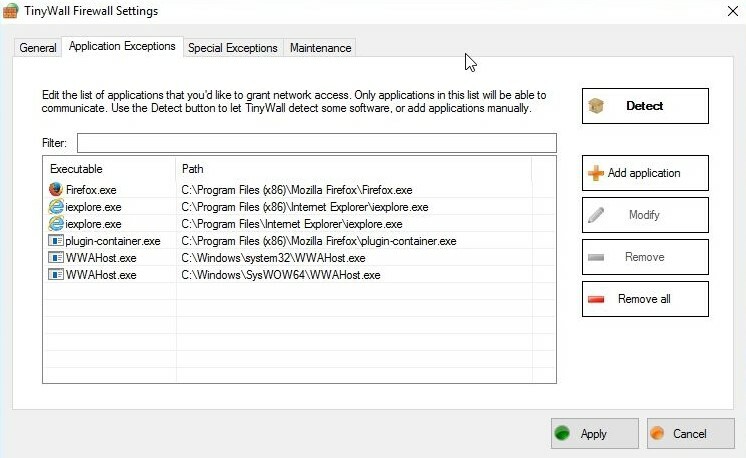 On the other hand, you can block any process with the Comodo KillSwitch feature, and you can see all the running applications and services of your PC from this window. Download the software by clicking here. AVS Firewall is a user-friendly interface that almost everyone can use easily. 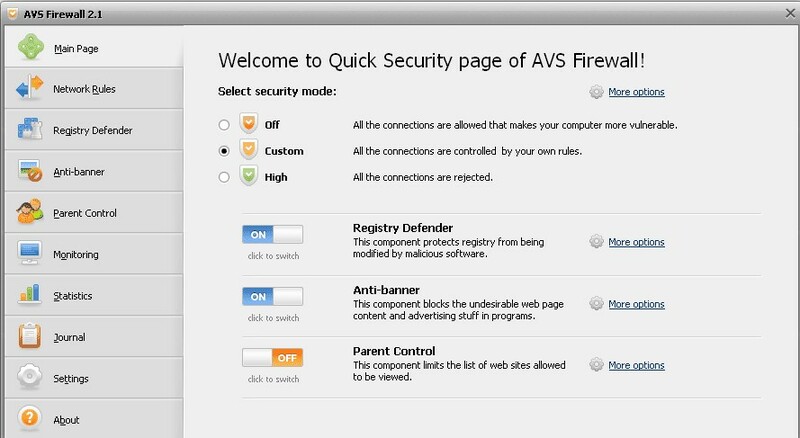 AVS Firewall will keep your PC safe from various malicious registry changes, annoying popup windows, flash banners and most online ads. You can also customize the URLs in the AVS Firewall, which will not show any type of ads and banners. AVS Firewall, which is a lot easier to deny that the specific IP address, ports, program allow. 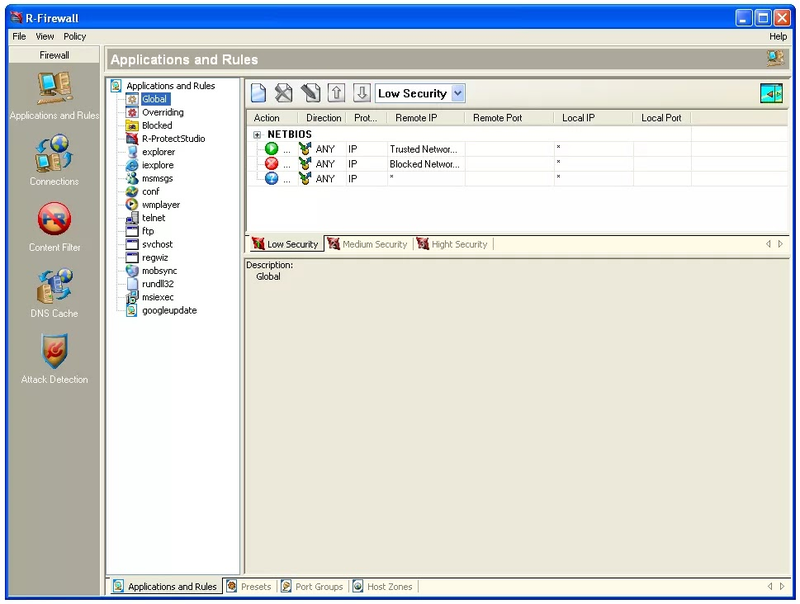 You can easily add programs to the firewall or manually from the running process or manually. On the other hand, there is a Parent Control which allows you to keep the password protected by the specified websites and the firewall program. On the other hand, you can also monitor what key connections are used on your PC through the journal section. Download the software by clicking here. TinyWall is on the third place in our list of the top 10 free firewalls program today. 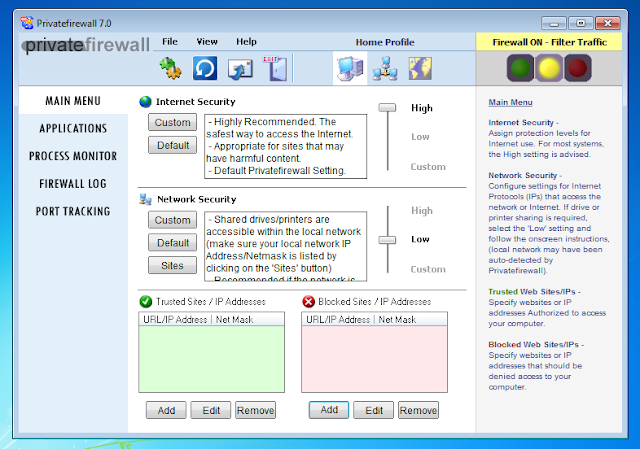 One of the unique features of the list of other firewall programs is that there are no additional instructions and prompts, a simple firewall is TinyWall. Here is an application scanner that will scan your PC programs first and then you can add programs to the firewall's safe list. You can also manually process any process, file or service on your PC. It has Connections Monitor options, where you can see all the processes of your PC that are using the internet; Then right-click on it to close the process and if you want it will have the option to scan with various online antivirus, including VirusTotal. Download the software by clicking here. 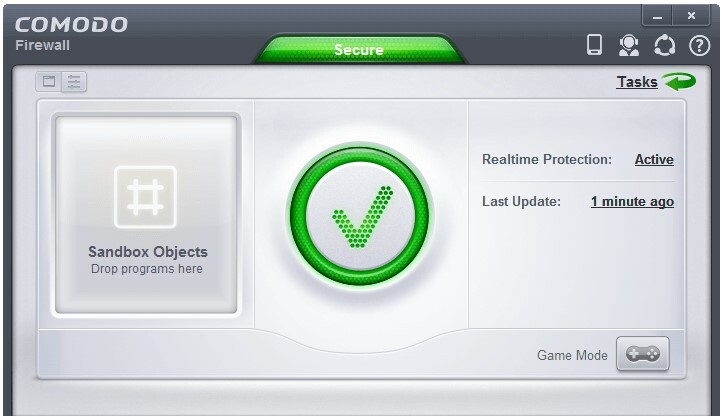 NetDefender is the best for those who want to run the basic program. Because NetDefender is a very basic firewall program. NetDefender is a source and destination IP address and port number that allows you to block or allow any address by using protocol. 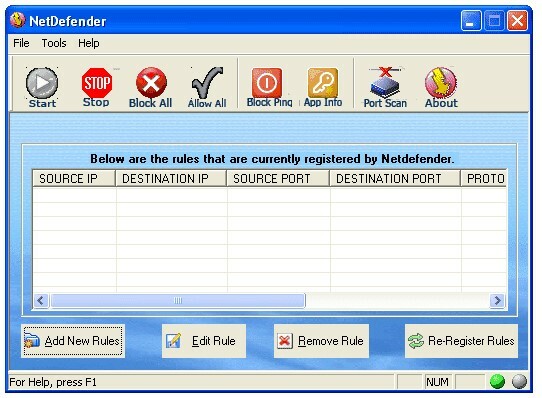 This means that you can block any FTP or other port from NetDefender using the Internet. On the other hand, for blogging to use the application from the Internet, you must manually add the specified application from the list of all the applications to the block list. It also has a port scanner that allows you to monitor which ports are being introduced on your PC, and you can turn off the specified port if needed. Officially you can run NetDefender with Windows XP and Windows 2000, but it is running Windows 7 and 8 without any problems. This program is suitable for those who want basic firewalls for older PCs. Download the software by clicking here. 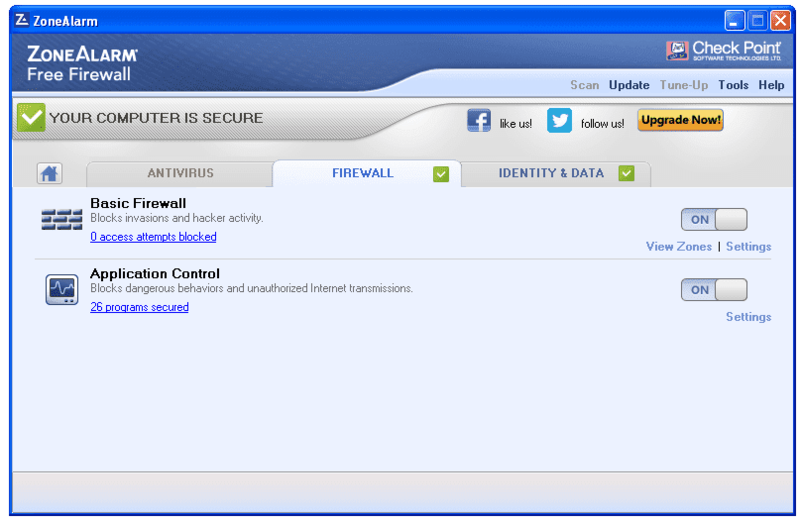 The ZoneAlarm Free Antivirus program is a separate firewall configuration. This means that you will get the ZoneAlarm Free Firewall program if you exclude the Just Antivirus section. 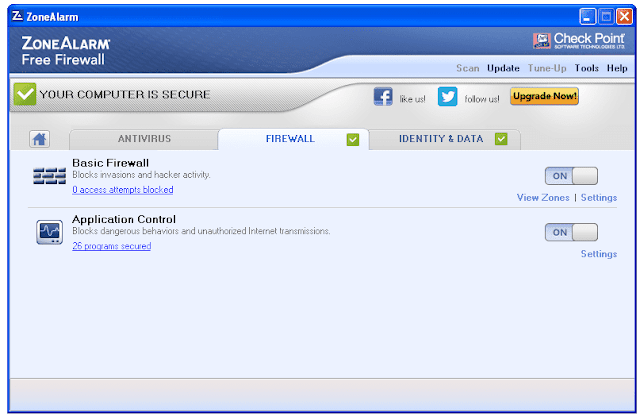 However, you can also install ZoneAlarm free antivirus with a firewall. When you install the ZoneAlarm Free Firewall program, you will be given two options. Auto-Learn and Max Security In the first step, the program will implement the best firewall settings on your usage and in the second you will be able to customize all the settings and applications yourself. ZoneAlarm Free Firewall can lock any application, process, or service on your PC to prevent any kind of malware damage, including Game Mode. There will be no notification from the firewall when viewing an app or movie. You can also change the securitized mode of a public and private network through the slider and you can easily increase or decrease the firewall protection level through the slider. Download the software by clicking here. PeerBlock works very differently from other Firewall programs. This firewall program blocks direct IP addresses without blocking your PC programs. PeerBlock has different categories for blocking IP addresses. For example, you can load the list of IP address of Internet access to all your PC programs, service and block your unnecessary and interactive program's IP address in outgoing and incoming two. You can also block all IP addresses of a whole country or organization. In this way you can create a block list of IP addresses by yourself or PeerBlock will be able to download a list of different IP addresses from the Internet. PeerBlock is one of the best software to block IP addresses. It will work in all versions of Windows. Download the software by clicking here. Copying screen contents, monitoring clipboard content, starting shutdown or logoff, allowing debug process to start, allow, ask, block You will get advanced options given or not given. You can also close all network activity on PC by clicking on the right mouse button on the Taskbar Privatefirewall icon in just one click. You also get the feature to block specific IP addresses. Download the software by Clicking here. You can get all the firewall program features in R-Firewall, but using this R-Firewall program is a bit difficult, so this program is in eighth place on our list today. Using a user interface is a bit difficult and you will not get any type of inline instructions from the program. PeerBlock at the ninth place in the list The program has stopped at the end of today's list due to regular updates being stopped. After the release of the program, the last update of the program comes in January 2014. 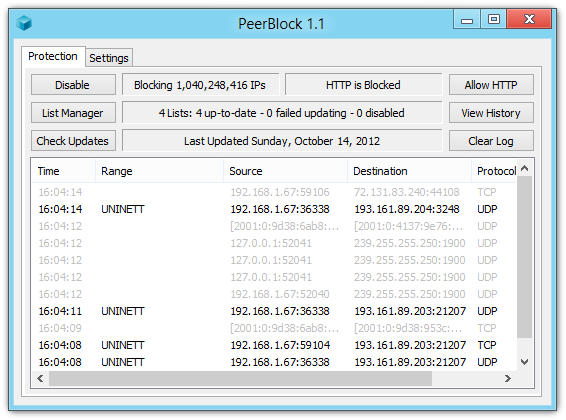 PeerBlock is a free and open-source personal firewall program. Using this, you can block the incoming, outgoing and monitoring of a blacklisted host on your PC. 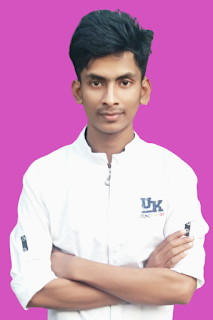 These blacklists are provided from iblocklist.com site. In addition to the blacklist addresses, you can add your own site and IP address to the program. There are also IP and HTTP trackers in the program, including log time, source, and tracker protocol monitoring features. Download PeerBlock by Clicking here. At the end of our today's list is GlassWire From today's list of all the firewalls, its interface seemed pretty good to me personally. Besides the beauty, the Fayalwalla is also good work. But look at this beautiful firewall program is just fine, not a user-friendly, so we have today's GlassWire at the end of the list. 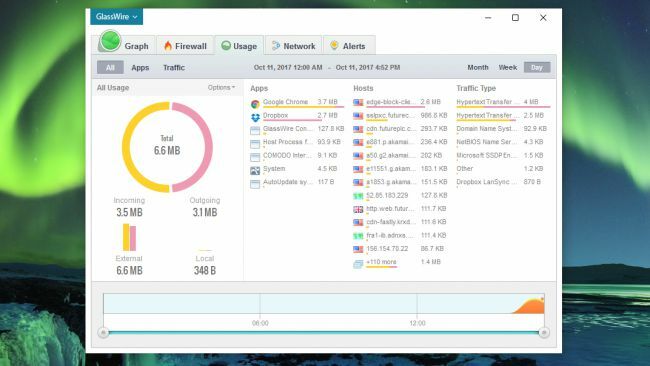 The firewall allows you to show any program or process of the PC using the internet and show you how much it is using. You can see the network traffic usage, there is also a chance to block specific programs on the Internet and there is also a chance for program scanning. After installing GlassWire, you will get notification from the firewall if any new program or service is accessed from the Internet and from there you can stop the program from net access or give access to the network access. In addition to the free version, GlassWire has a premium version. Premium versions will get some premium features such as recording more than one month, as well as multiple remote connection monitoring and webcam and microphone monitoring features. Click here to download GlassWire.